We listened to a flock of eiders calling somewhere out in the soft light of the bay. The Maine coast takes on a different look each day. The Sun shifts, the fog comes and goes, the gloomy clouds crack open and reveal what Pamelia's mom used to call "just enough blue sky to make a Dutchman's breeches." Warmer air is moving in—two days ago we saw our first robin and the first vivid green of a sprouting fern. Yesterday we learned that because of the mild winter, Maine syrup makers are tapping their trees two weeks earlier than usual (http://www.wabi.tv/news/27855/maple-syrup-season-hits-maine-early). 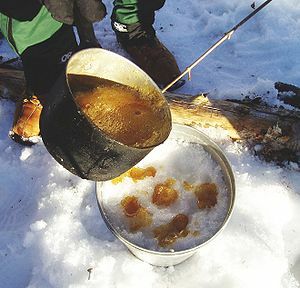 New England's syrup-collecting season has been moving earlier and earlier (though not typically this early) for more than a decade, according to experts I spoke to a while back at the University of Vermont's Proctor Maple Research Center. By the time Maine's traditional Maple Sunday rolls around in late March, I hope there's still some snow to scoop up and drizzle with syrup, creating the candy known around here as sugar on snow. These are the flowers known as Dutchman's breeches—named back in the day when people dried trousers on clothes lines, not in machines. 2) The dragonfly is believed to have gotten its name from a Romanian folktale about a horse that the devil turned into a giant fly known as the Devil’s Fly. The Romanian word for devil is drac, which also means dragon, and the second meaning eventually was applied to the insect. 2) Casimir Funk, a Polish biochemist, was born 128 years ago this week. What was his most famous contribution to the world of science? a) In 1918 he invented the first television. b) In 1912 he discovered the existence of vitamins, which humans knew nothing about before then. c) In 1901 he published the first scientific treatise proving that the Moon was not made of cheese. d) In 1922, during the flapper era, he discovered the chemical imbalance in certain odd-behaving domesticated fowl that gave rise to the term "funky chicken."